On 16 March 2018, the official statistical body of Belarus Belstat has announced that GDP growth in the first two month of the year has accelerated. Meantime, the weak regional development cast doubt on the sustainability of Belarusian economic growth in the future. Decreasing population number, lack of investment, and depressed business climate accompanied by low average wages play here a crucial role. Finally, on 20 March 2018, the President of Belarus Alexander Lukashenka has announced plans for the establishment of a new ministry – The Ministry of Digital Economy. The digital transformation of the economy needs authorized governance. 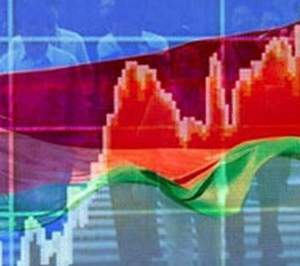 According to Belstat, in January-February 2018 the GDP growth reached 5.6 per cent year-on-year. The industrial production has increased by 10.3 per cent and exports of goods by huge 36.5 per cent (in January). Finally, during the first two months of 2018 investment in fixed capital has increased by 24.8 per cent year-on-year. The current positive economic figures ground on several factors. First, the world oil prices increased during the previous year. Second, because of administrative stimulus real wage growth accelerated, which led to the expansion of consumer demand. Third, because of first two factors, the economic mood of economic agents significantly improved. Firms expect more orders, hire more workers, and actively lend and invest. Households, hoping for more income in the future, actively take loans, increasing current consumption. Banks began to lend more actively while continuing to reduce credit rates. These positive shocks warmed up domestic demand. In addition to domestic demand, new shocks spurred external demand (for example, Russian demand for Belarusian exports began to grow due to increased growth in Russia amid more expensive oil). Meanwhile, because of active administrative policy, the real wage growth since the 4th quarter of the last year was about 30 per cent. This giant increase gave rise to a wave of consumer optimism and demand but also produced a negative impact on price stability, the dynamics of the exchange rate, the fiscal balance, competitiveness, and profitability of Belarusian firms. In the case that the authorities in the future will not abandon the artificial stimulus of wages, these negative effects will continue to grow, turning into a full-blown threat to price and external stability of the Belarusian economy. Meanwhile, the steady decline of the district Belarusian population in general and its working-age part, in particular, reveals crisis tendencies in the regional development. According to Belstat, the district’s population of Belarus constantly decreases and in comparison with the beginning of the century its number shrank by almost a quarter (see Figure 1), contrary to the urban population of large cities that increased by approximately 9 per cent. Moreover, the official statistics reveal even more negative trend for the district’s working-age population. During last two decades, its number steadily declined by 1.4 per cent each year and in the last few years its reduction even amplified. All these mean that rural life loses its attractiveness to both adult and young Belarusians. One of the key reasons stays the significant difference in wages between districts and large cities. The average salary in districts constitutes approximately 78 per cent of the average salary in major cities of Belarus. The dynamics of entrepreneurial activity in the districts adds additional pain. In particular, over the past three years, the number of micro and small organizations has decreased by 5 per cent (Figure 2). At the same time, the additional development of small business in rural areas possesses potential sources for regional economic growth and, first of all, in agribusiness. Additionally, Belarusian districts significantly lag behind in attracting foreign direct investment (FDI) that represent a major source of new technologies and create a potential for export diversification of regional goods. For example, during 2005-2015, districts on average attracted 4.6 times less FDI per capita than the major cities of Belarus. On 20 March 2018, Alexander Lukashenka has announced plans for the establishment of the Ministry of Digital Economy that will bring the entire domestic economy on the digital platform. According to Alyaksandr Kurbatski, a member of the Council established for the development of the digital economy in Belarus, IT would penetrate into all sectors of the economy. Now virtually any sphere of human activity affects digitalization and this process really needs to be managed and coordinated somehow. The creation of a new Ministry fully fits into the ambitious task of the authorities to turn Belarus into an IT-country, reorienting the Belarusian IT-sector to a product model. The government expects that this will significantly increase the value added and increase the level of technological equipment. However, the long-run consequences of this project still stay unclear. The expectations of long-term positive effect ground on the fact that any progress in improving the level of technical equipment and the integration of Belarusian firms into the global chains will add additional benefits to the country. On the other hand, additional benefits and preferences for the IT-companies may exceed effects obtained. Moreover, the focus on sectoral preferences may adversely affect the transparency and competitiveness of the business environment. In the short term, the decree may have a beneficial effect, but only in the form of capital inflows to the country’s IT sector. Taking all together, the skyrocketing economic growth of the first two months of the year added optimism to the whole economy, however slow progress in the regional development cast doubt on its long-run sustainability. On 6-8 April, Chinese defence minister Wei Fenghe will visit Belarus. Wei’s combined visit to Russia and Belarus, his first foreign trip since taking up the post, demonstrates recognition that Minsk gives the highest priority to its partnership with Beijing. The Belarusian authorities have chosen orientation towards Beijing as a fundamental dogma in foreign policy. Belarus pursues this policy despite contradictory effects of the alliance with China. The Belarusian government hopes that it will get a better place in the sun in a future world shaped by China. For the time being it tries to reap some smaller benefits from Beijing to restructure its industry, find new loans and rearm. While at the forum Alexander Lukashenka spoke of “reshaping the world’s economic map,” in a subsequent meeting with Chinese leader he assured Xi Jinping that Belarus was willing to help China “defend peace throughout the world” too. Other Belarusian officials sound a similar note. 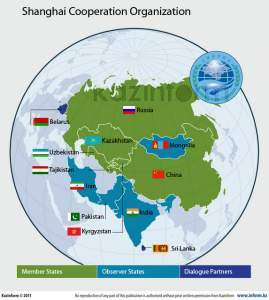 For instance, at a December meeting of the Chinese-dominated Shanghai Cooperation Organisation, Belarus’s prime minister Andrei Kabyakou insisted that the member states of the organisation should create additional factors for world security and stability. To underline his belief in China’s ascendancy, Lukashenka even made his youngest son, Mikalai, learn Chinese. A video with Mikalai congratulating the Chinese on New Year in Mandarin appeared on YouTube on 18 February. How much do these pro-Chinese moves by Minsk impress Beijing? On the one hand, top-level Chinese officials regularly visit Belarus. Last year, six Chinese ministerial-level officials, as well as state and party administrators of three Chinese provinces, visited Belarus. Minsk negotiated with such major Chinese companies as Sinomach, China UnionPay and others. 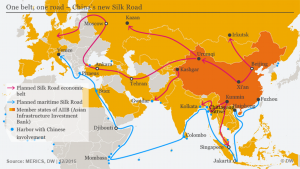 Belt and Road Initiative’s official routes and involved nations (in orange). Belarus marked grey. Map: DW. On the other hand, even Belarus’s status in China’s global plans, such as the Belt and Road Initiative (BRI), remains unclear. Numerous Chinese and international publications do not include Belarus in the initiative. The Belarusian president, responding to this problem, announced that the Great Stone Belarus-Chinese industrial park will be an instrument by which Minsk should participate in the BRI. For about three years now, the two countries have been constructing the industrial park which will provide the most favourable conditions for Chinese firms. 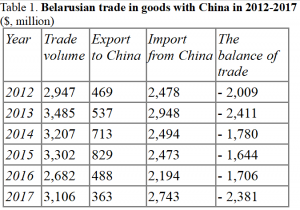 To make things worse, since the mid-2000s Minsk suffers from a huge and increasing trade deficit with China. It dramatically grew again in 2017 (see Table 1). Even the planned indicators of export growth for China for 2017-2020, adopted by the government last year, demonstrate Minsk’s lack of hope that it can significantly reduce the deficit anytime soon. After keeping silent for years, Belarusian officials started raising that issue with every visiting Chinese counterpart from 2016 onwards. 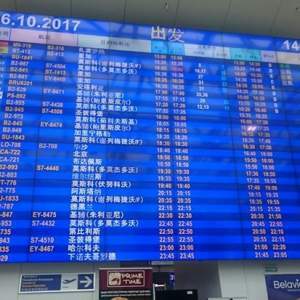 Beijing responded in several ways. First, it offered Minsk assistance, for instance in the form of unspecified “technical economic aid” to build housing for socially vulnerable groups. It shared defence technologies and sent armoured vehicles as a gift to Belarusian military, with the last instalment arriving in January. Secondly, it opened its markets for Belarusian food exports: in 2016 – for dairy, in 2017 – for meat. The absolute figures of such export last year – about $10m – fail to impress if compared to Belarusian food exports to its main market in Russia which made up $2.1bn. The government, however, celebrated this achievement as a promising start. On 28 December, the head of Vitsebsk province Mikalay Sharstnyou in a commentary for Belarus Segodnya, a media outlet of the presidential administration, said that the Chinese market should relieve the national agriculture and food industry which regularly faces closure of Russian markets. He added that in 2018 some dairy factories in Vitsebsk province would be adapted to meet Chinese standards. Meanwhile, Minsk wishes to reshape national industry with Beijing’s help and pulls out all the stops to that end. On 18 March, TUT.by, an internet media outlet, revealed that Belarusian deputy minister of industry, Hienadz’ Svidzerski, has been appointed to run the joint Belarus-Chinese car manufacturing factory BELGEE. Apparently, he had not resigned from his office at the ministry, and so the appointment represented an extraordinary gesture of support for the project. The factory started operation last November and will produce 60,000 cars annually. Observers see several positive results of Belarus-Chinese industrial cooperation. Last December, the Chinese САМСЕ corporation completed a cellulose factory in Svietlahorsk. By January, another major Chinese company Zoomlion launched serial production of construction and special vehicles in Mahilyou. At the same time, this company organises the manufacture of tower cranes at the bankrupted Strommashyna factory nearby. Another Belarusian firm, Amkador, received a Chinese loan of $192m to construct its new factory. On 20 February, Belarusian state media reported a programme aimed at the industrialisation of Belarusian regions. The programme intends to set up more than a hundred enterprises throughout the country by 2025. The Belarusian ministry for industry hopes that China will become a major source of support for the programme. 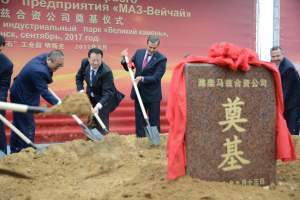 Beginning of the construction of an engines producing factory, a Belarus-Chinese joint venture. Image: MAZ. Belarusian media usually fail to discuss the contradictions inherent in Chinese involvement. For instance, they wrote about Minsk Motor Works (MAZ) constructing an engines plant together with the major Chinese Weichai corporation. They ignored the fact that it creates competition for MAZ which has produced engines in Belarus for many decades. Likewise, no discussions followed when last November the Chinese Midea corporation announced its plans to launch production of home appliances, which will compete with the Belarusian firm Atlant. Only recently has some criticism appeared. In January, Narodnaya Gazeta and Respublika, government-affiliated dailies, published articles criticising the BELGEE automobile production project and the Chinese Zongshen corporation’s plans to acquire Homselmash, the Belarusian machinery manufacturer. Belarusian officials maintain a sycophantic line in dealing with China, with Lukashenka setting the example by praising “Great China.” Yet Minsk has started demonstrating more pragmaticism regarding its Chinese partners. Belarus now asks for and gets some rewards for its Sinophile policies and the losses it suffers because of them. The projects with Chinese involvement are not considered immune to criticism anymore. That detail makes future Belarusian cooperation with China less idealised, and instead more responsible and efficient.